Editor’s Note: This post was written by Enough Project Intern Emily Collinson. Enough Project partners, The Resolve and Invisible Children, recently released a new LRA Crisis Tracker Report, The State of the LRA in 2015, which provides analysis of trends in Lord’s Resistance Army (LRA) activity such as attacks, abductions, fighting capacity, and illicit resource trafficking during 2014 and into the first quarter of 2015. This up-to-date and reliable data on the LRA crisis is crucial to the continuation of regional and international efforts to counter the group’s activities. The report indicates that the LRA’s fighting capacity is dropping due to fighter defection (though at a lower rate than recent years), deaths of senior officers, and the release of 127 women and children. Many of these long-term abductees were set free because the LRA is under pressure from counter LRA operations, led by troops from Uganda, Democratic Republic of Congo (DRC) and South Sudan, closely assisted by US military advisors. The LRA Crisis Initiative credits both decreased fighting capacity and international attention on the LRA for the significant reduction of civilian killings, which have dropped from 1,200 in 2009 to only 13 in 2014. While killings are fewer, attacks and abductions have increased – in 2014, total LRA attacks rose 10% and abductions 32% compared to 2013 – with the hub of existing LRA activity moving out of eastern Central African Republic and further north in the country towards South Darfur or into the DRC, where 90% of recent LRA attacks and abductions have occurred. The State of the LRA brief also places emphasis on the armed group’s ability sustain itself through the looting of small villages, where LRA fighters told victims “that the LRA does not[sic] want to harm them, but only, wants enough food to survive”. This report also show that the financial profits from the sale of illicit gold, diamond, and ivory is a key survival strategy for the LRA. 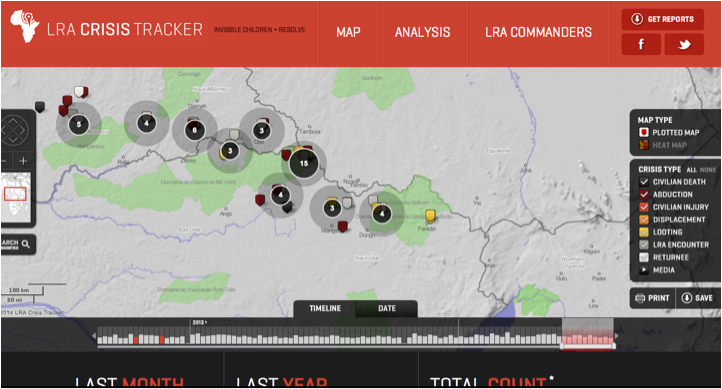 For more information on the LRA Crisis Tracker and to download the full report, see their homepage or download the LRA Crisis Tracker APP.